We wanted to get married, and we wanted the people we loved to be there. That was really the only "theme" I had in mind, as a bride. I don't get it. Wedding culture. Spending a down payment for a house on a dress and buying a cake instead of paying off your car. I didn't want to do that. I didn't want to even know if we were able to do that. I just wanted to be married to my best friend and I wanted to be surrounded by happy people who love us. When everything was finished, mini-honeymoon included, we spent about $1500 on our wedding. However, my friend Avy gave me her wedding dress. 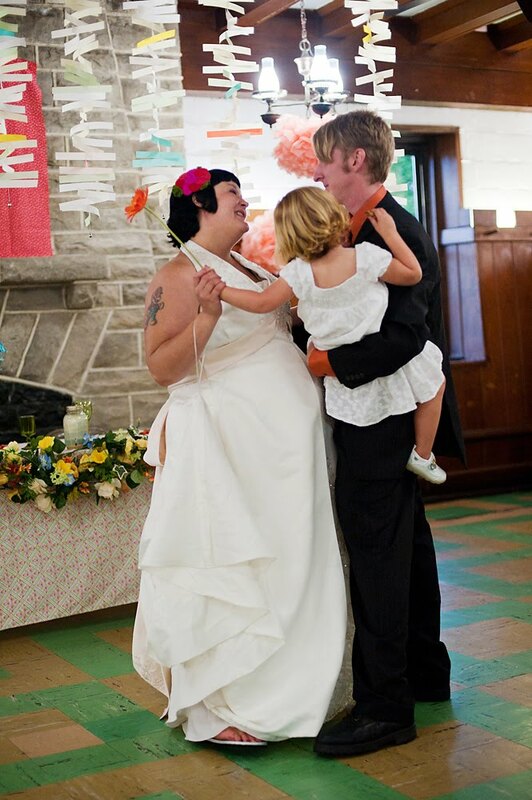 She had gotten married the summer before, and she just happened to be 8 months pregnant at the time, and my size. I will forever be grateful for her wonderful gift. Kurt's parents were also generous enough to pay to have the reception catered, as a wedding gift to us. If you include the dress and food in the cost, I'd say that we pulled everything off for about $2500. I was adamant about not going into debt just so that we could be married. 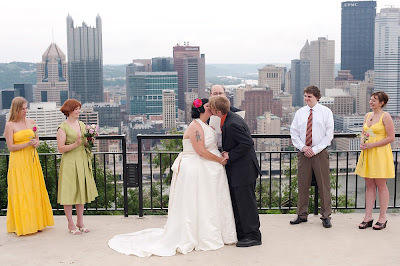 We chose a free venue for the ceremony on an overlook on top of Mt. Washington in Pittsburgh. 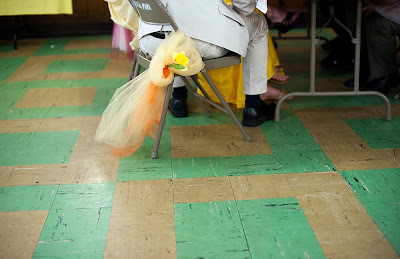 We used thrifted linens and sheets for our tablecloths. I bought wildflowers by the bunch at the grocery store the day before the event and cut them myself. I wore sparkly flip flops from Target. My 3 year old daughter, Scout, walked me down the aisle wearing a sundress from Old Navy. We relied on friends and family to take pictures. 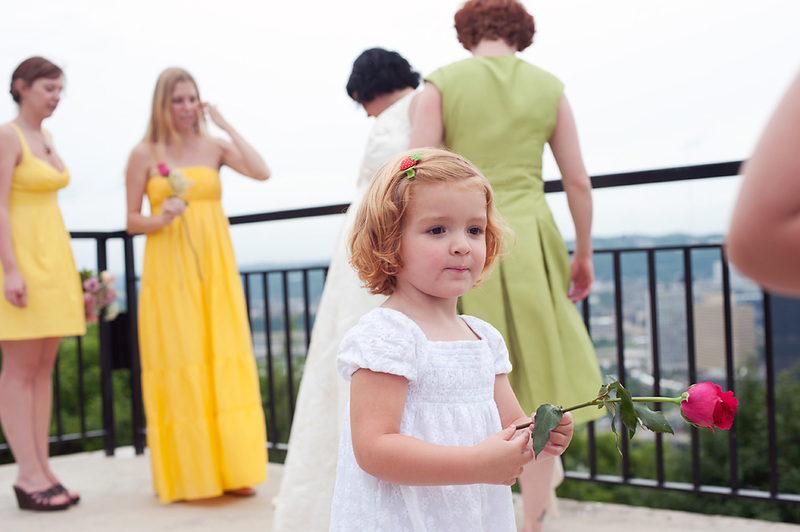 (Of course it helped that we have a few amazing photographer friends.) We made about a million of these. My friend made about a million of these. We made alcoholic punch and lemonade and people served themselves out of punch bowls, using mason jars for glasses. 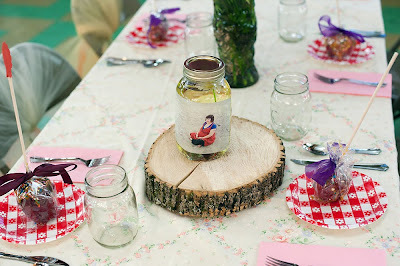 I hand cut place cards and guestbook cards and seating cards. We made candied apples for favors. It was a lot of work, especially for a 35 week pregnant woman with a toddler. But, we didn't go into any debt and we didn't succumb to the idea that a wedding has to cost a lot of money to be considered a real wedding. The ceremony itself was simple and lasted about 15 minutes. The bulk of it being our vows. We wrote the whole thing ourselves. It didn't even include any cheesy definitions of love or the rules of marriage. It only included the things we wanted to say. We don't live the rest of our lives with a lot of posturing and flourish. Why would we choose to make our wedding that way? You showed up at my door on an afternoon in October and you were boyish and blue eyed and all grown up with a new car. I thought that you seemed maybe just a little bit dangerous and a little bit perfect for me. We spent the next few months growing so big that we blotted out the sky. We might have even raised a little hell. We don't get into much trouble these days. And as much as a wild girl could love a dangerous boy, which was enough to crack the moon and send it plummeting into the ocean, I love you, the father of my children and the man who works hard and sacrifices consistently to make it so that Scouty, Louise and I can have a good life. You take good care of your girls and keep us safe and happy. Scouty walks around in a dark and looming world as a dancing pinprick of light knowing that she is loved and protected and valuable because you make it apparent in every moment of her super big girl life that her daddy will always be there for her. That because of her daddy, she can trust that the world is good. As a partner, you've turned me into a believer, too. My whole life, I never belonged to the world. I never made sense and I wore on every one, dragging around in the muck and the mud for the beauty I'd heard existed in every one of God's own creatures but nobody could see in me. But then, I found myself in your favor and realized that everything had always been perfect. You made me into an open, shining thing. I was impossible because you were impossible and everything was going to be okay, from now on. Every one of your handsome boy movements promised me that. I take you, forever and ever, to be my friend and my husband. I trust you to be able to fix anything, to make the girls and me happy and keep us safe and to always always want us, even when we're bad and bossy and grumpy. I take you because you're the only thing, besides your daughters, that I've ever been in awe of, that I've ever respected absolutely and been able to marvel at explicitly. I am so proud to belong to you. I swear that I'll never do you wrong. I think it's about time you go ahead and make an honest woman out of me. Amanda, I remember the first time I met you. And from that moment on, you have acted as a powerful and effervescent force on my life. To the quiet lulls, you brought an elevating beauty and a boiling laughter. To the manic hardships, you brought a serene perspective and an honest wisdom. To where there was nothing but a grey horizon and a hollow clock heartbeat, you brought an overwhelming love, an unwavering devotion, and the missing pieces to a broken life which mended and then flourished under your careful hand. I now fill the quiet moments of my day recalling all the time that we spent together as kids, or imaging what our time will be like when we’re old and free to share a quiet world together. I am constantly only spending my day counting off the minutes until I can see your face, again. My love for you can feel as vast and encompassing as the sun, or as simple as a child who just wants to see his friend. Our relationship began as simple as an honest friendship, and grew into something more impressive, important, and beautiful than I knew was possible. I fell in love with you with a realization that my life would not be suitable for living without you by my side. And as you stand before me today, I see somebody who is no more separated from my life than the air I breathe or the blood in my veins. You are the woman I love and the mother of my two beautiful daughters. But through all of this, and perhaps most importantly, you have always just remained my best friend. I made a simple promise to you years ago that I would always be good to you. I pray that you feel I have honored that promise, and today I renew that vow to you. I will always be good to you, because you deserve it. I promise to always love, honor, and defend you. I will happily care for you for the rest of my life, and I promise to stand by your side, as your husband, from this day forth. In the final hours, though, some people started to freak out about our plan. They had a lot of questions about how a bunch of handmade crafts and a made up ceremony at a public overlook were going to add up to being an actual wedding. I admit that I started to succumb to the pressure. I felt suddenly like... what if this isn't okay? What if a wedding has to be a $4000 cake kind of deal? What if our suggestion to wear whatever you wanted was an abomination? Was it a big deal if people got rained on while attending our ceremony? At the last second, I felt so pressured and just wished we had decided to elope. If I had it to do all over again, I would have closed myself off to the what ifs and criticisms of our humble approach to our planning. I would have remained calm in my vision, which was just to have a wedding that represented us honestly. 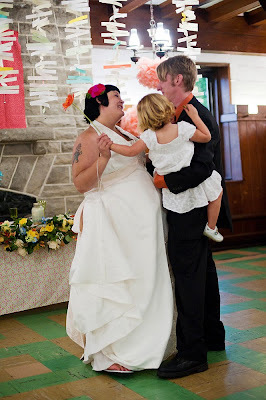 To have a wedding that didn't try to claim a lot of things about us that weren't true. We didn't need to be seen as a couple who had it all and could compete in the world of modern wedding culture. I didn't need to outdo anybody with my bridey-ness. I just wanted to feel happy on our wedding day. We didn't need, or even really want things to be perfect, because perfect things aren't beautiful. But everything was very us. 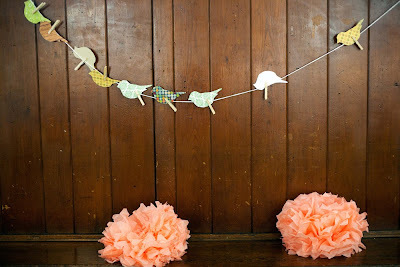 If you're planning to break free of the wedding mold, I encourage you to just do it. Do things your way. Be true to your ideas. Pay off your car. It's really okay. It is, I promise. 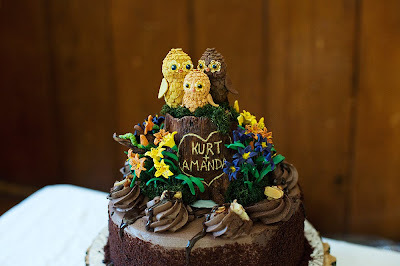 You'll still love each other without being enlightened about the way a $4000 cake tastes. You might love each other even more. Amanda King is a 32 year old mommy of two beautiful girls. She can be found baking or biking depending on the weather. 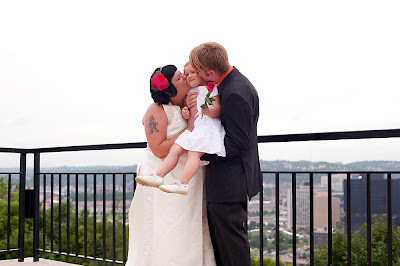 She is married to the world's sexiest accountant and they all live happily ever after in Pittsburgh, PA. She blogs, often and with enthusiasm, at Last Mom On Earth. Justin Visnesky grew up in a village in Pennsylvania. He makes photographs of the simple, quiet times in life; taking the ordinary and making it something more, something for the keeping. His work has been featured in various print and online publications and has been exhibited throughout the US. Justin lives with his wife and son in Pittsburgh, Pennsylvania. 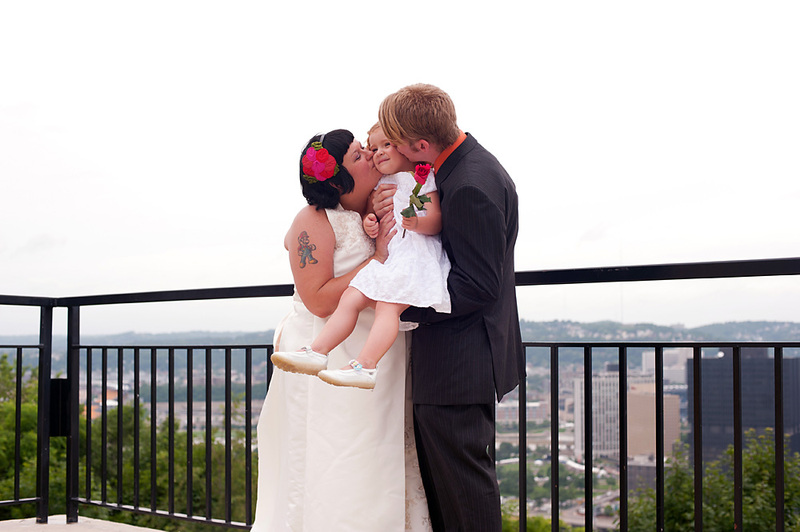 A huge thank you to Amanda for sharing her story with 2000 Dollar Wedding kindred spirits! If you have an idea for a guest post you would like to write, please send me an e-mail! Yay for you and your wonderful family! Thank you so much for sharing your brilliant and magical process! I loved this wedding! 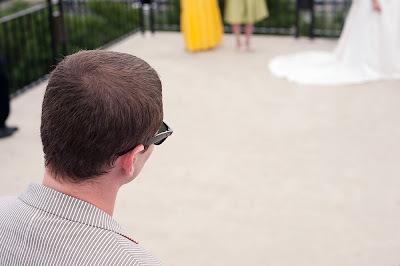 And it I felt like it was better and more fun than stuffy, expensive, 'traditional' weddings. We had 70 guests and a popular, local italian restaurant catered. (Fruit, cheese and fresh veggies for appetizers. Vegetable lasagna, regular lasagna, chicken breast, steamed veg, salad and bread for the meal. Also there was a cookie table, supplied by guests.) We just had everyone serve themselves, buffet style and we made alcoholic punch and also had beer. The food and drink ended up being about $1000 dollars. We ended up with TONS of leftover food, too. I'm sure that everybody could have been fed for closer to $700 or $800, but we didn't want to run out of food, so we over estimated. I suggest checking with local favorite restaurants for catering, as opposed to an actual event catering business. I hope you find something that lets you stick to your budget! I love your wedding! I'm looking to do something very similar next summer (in Pittsburgh!). Can you share your reception location and the caterer? 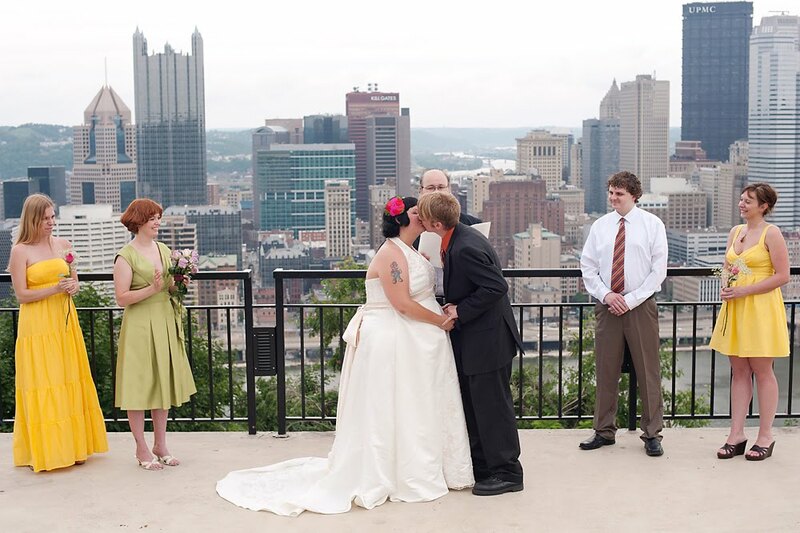 Who did you have to contact to get married on the outlook on Mt Washington?